on the anniversary of the fall of the berlin wall, gregor gysie and volker beck managed to get journalists and activists max blumenthal and david sheen banned from speaking at an event at the volksbuehe in berlin. the two then gave a speech at an alternative event. the next day, the same ppl tried to get them banned from speaking at the bundestag, but fortunately, this time, they didnt manage to censor the debate on palestine. after their speech, max blumenthal and david sheen tried to confront gysie who apparently hid in a toilet. Author Max Blumenthal had one goal in mind when he went to the Bundestag, Germany’s parliament, in Berlin on Monday. He wanted to show a photograph of the al-Kilani family – German citizens killed by an Israeli bomb that struck the Gaza City home they were sheltering in last summer – to leading left-wing politician Gregor Gysi. On 21 July, Ibrahim al-Kilani and his wife Taghrid were killed along with their five children: Reem, 12, Sawsan, 11, Yasin, 9, Yasser, 8, and four-year-old Elias. Mahmoud Derbas, aged 16, was killed in the same strike. Members of the al-Kilani family, who were German citizens, wiped out in an Israeli attack in Gaza City on 21 July. Blumenthal hoped to ask the lawmaker and influential figure in the center-left Die Linke (The Left) party why he and other German leaders had said and done nothing to bring justice for the al-Kilanis – and why Germany is instead providing Israel with new gunboats which will likely be used to attack Palestinian fishermen. Instead, as the video above shows, there was a bizarre spectacle as Gysi fled from Blumenthal and fellow journalist David Sheen and locked himself in a toilet. In the hours before the incident, Gysi was behind an unsuccessful effort to cancel Blumenthal’s and Sheen’s appearance at the Bundestag earlier that day. That event was initiated by Die Linke legislators Inge Höger and Annette Groth, two long-time supporters of Palestinian rights who have been smeared as “anti-Semites” by the Simon Wiesenthal Center. Although The Jerusalem Post reported that Gysi had ordered the event canceled, evidently members of his party ignored him and the meeting went ahead. Blumenthal was able to speak about what he witnessed in Gaza and Sheen told the German audience about Israel’s racial violence and incitement against African refugees and others. It was after the event, attended by dozens, that Blumenthal and Sheen requested to meet Gysi to confront him about Israel’s crimes in Gaza and the smears that Gysi and his acolytes had disseminated against them. Rather than explain himself, Gysi ran away. The failed effort to cancel the Bundestag meeting followed a more successful effort at censorship on Sunday, when Blumenthal and Sheen were disinvited from speaking at the Volksbühne, a public theater in Berlin. This came after a smear campaign promoted by Volker Beck, an anti-Palestinian legislator with Germany’s Green Party, Petra Pau of Die Linke and Reinhold Robbe, the president of the German-Israel Friendship Society and a member of the center-left Social Democratic Party. Blumenthal’s and Sheen’s appearance would serve “to promote anti-Semitic prejudice by comparing the terror of the Nazis with Israeli policies,” the ostensibly leftist politicians wrote in an open letter. Speaking to The Electronic Intifada from Berlin, Blumenthal pointed out that the smear campaign against him and Sheen – and more importantly the effort to prevent discussion about Israel’s crimes in Gaza – was the product of the anti-Palestinian network funded by American billionaire Sheldon Adelson. Blumenthal notes that it was Benjamin Weinthal, a Berlin-based anti-Palestinian activist, who initiated the smear campaign with an article in the right-wing Berliner Morgenpost, and later in The Jerusalem Post, falsely claiming that the Bundestag meeting would not take place. Weinthal is a fellow of the Foundation for the Defense of Democracies (FDD), which Blumenthal calls “one of the most right-wing neocon think tanks there is.” FDD describes Weinthal as its “eyes and ears on the ground in Central Europe.” Weinthal was also behind an unsuccessful 2010 smear campaign against The Electronic Intifada. Weinthal’s article is filled with torrid quotations – including from Beck – smearing Blumenthal and Sheen, who are both Jewish, of being “anti-Semites” because of their criticisms of Israel. FDD received $1.5 million from Adelson from 2008-11, making the casino magnate the group’s third most generous donor. Adelson has also given tens of thousands of dollars to the Simon Wiesenthal Center. Blumenthal points out that the material smearing him in the German media comes from “my Simon Wiesenthal Stasi file” – an ironic reference to the former East Germany’s notorious secret police. Last year, the Wiesenthal Center featured Blumenthal on its list of “Top Ten Anti-Semitic/Anti-Israel Slurs.” He tied for ninth place with Pulitzer Prize-winning poet Alice Walker. Typical of such smears, the Wiesenthal Center offered up gross distortions of Blumenthal’s book Goliath to falsely present him as an anti-Semite. But such tactics are nevertheless effective in Germany, where politicians are generally terrified of criticizing Israel and confuse offering unquestioning support for Israeli crimes with atonement for their country’s genocide of Europe’s Jewish population. Weinthal got a prominent legislator in Chancellor Angela Merkel’s center-right party to join the attack, claiming that the Blumenthal-Sheen event sponsored by members of Die Linke would do “damage to Germany’s reputation” by making an argument for recognition of a Palestinian state. In its 2010 roadmap for sabotaging the Palestine solidarity movement, the Israeli think tank the Reut Institute pointed out that the value of support for Israel is far greater if it comes from the left. This is because the left is seen as generally more receptive to Palestinian rights. Weinthal’s attack on Blumenthal and Sheen appears to come precisely from that playbook. Weinthal got members of the Greens, Social Democrats and Die Linke to push his far-right, anti-Palestinian agenda. And now the affair is being used to go after those perceived as being hostile to Israel, with calls for Groth and Höger – the lawmakers who sponsored the Bundestag meeting – to be purged from Die Linke. Blumenthal told The Electronic Intifada that several members of Die Linke urged Gysi to meet the two writers after their Bundestag meeting. But, according to Blumenthal, Gysi sent text messages to his colleagues saying he would not. Blumenthal and Sheen confronted Gysi anyway, demanding to know why he had endorsed the smear campaign against them. In the end, they came out fighting and it is the German politician’s reputation that ended up in the toilet. you might think that nothing is happening in palestine. while yesterday, the occupation army once again shot at fishermen in gaza and sank a boat. armed settler colonists AGAIN attacked palestinians – like they do several times per days on average of late -, this time in east jerusalem. baha samir badr. 13 years old. shot dead in his village beit lekya. shot straight to the heart while he returned from the olive harvest with his family. and yesterday evening, they shot baha samir badr. 13 years old. shot him dead in his village in beit leqya, near ramallah, near bil’in… another child, another palestinian child, and for most in this world, his death will never have accured, for some, it will become part of statistics. for his family and loved ones? friends? pain, pain, another hole, too much loss. for the rest of us – another reminder that palestinian life is currently unprotected, that palestinians can and continue to be murdered with utter impunity. according to maan news, baha is the 42 palestinian in the west bank murdered by the occupation so far this year. RAMALLAH (Ma’an) — A Palestinian teenager was shot dead by Israeli forces in the village of Beit Laqiya northwest of Ramallah on Thursday evening. Medical sources said Bahaa Samir Badir, 13, was shot in the chest after Israeli forces raided the village. Badir was reportedly shot in the chest from close range, and suffered from severe bleeding shortly before dying at the Palestine Medical Complex in Ramallah. Clashes broke out in the village of Beit Laqiya after news of Badir’s death spread. She added that the Molotov cocktails had posed a “direct threat” to the lives of the soldiers. More than 4,300 Palestinians have also been injured by Israeli soldiers in the West Bank since the beginning of 2014, as well as more than 11,000 during the nearly two-month assault on Gaza. The West Bank and the Gaza Strip have been under Israeli military occupation since 1967. One of the obstacles to the Palestinians gaining any semblance of justice has been the moral cowardice shown by the great majority of Jewish community leaders, from rabbis to journalists. Israeli governments would really have struggled to sell decades of Palestinian oppression as necessary if Jewish leaders had spoken out. That’s why I alert you to this article in the Washington Post from Rabbi Jill Jacobs. She describes the organised ethnic cleansing of Palestinians from Silwan by Israeli government-backed settlers, subsidised by Jewish and Christian tourists. When have Jonathan Freedland, Thomas Friedman, Roger Cohen or a host of other supposedly liberal Jewish commentators ever offered this kind of critique of Israel? An American nonprofit is making peace even less likely. At 2 a.m. one day last week, a group of Israeli settlers, protected by riot police, moved into 25 apartments in seven Palestinian-owned buildings in the Silwan neighborhood of East Jerusalem. Some of these apartments were vacant or recently constructed. In other cases, residents were away from home for the night. In one case, a young man had purchased an apartment to move into with his bride following their wedding. Instead, the couple is now enmeshed in a legal struggle with the settlers who have set up residence in their marital home. The biggest surprise of all? You may have helped fund this takeover. Elad, the settler group that organized this incursion, raises $6 million a year in the United States through the Friends of Ir David Foundation. As a nonprofit, donations to FIDF are tax deductible; funders can write off their gifts, which means that all of us who pay U.S. taxes helped subsidize the new settlement. That’s in direct opposition to official U.S. policy, which seeks a two-state solution and prohibits American aid to settlements over the Green Line. Even more directly, if you’ve traveled to Israel (as nearly half of American Jews, and a staggering number of American Christians, have), you may have visited the Ir David archaeological site, which includes Hezekiah’s tunnel and other finds from Biblical Jerusalem. A huge percentage of its 500,000 annual visitors are American, and it’s a hallowed stop on tours organized by synagogues, churches and schools. * That $15 admission fee paid by all those people? Money for settlers. Even the excavation of Ir David has damaged or destroyed Palestinian homes, while infuriating archaeologists who complain that Elad prioritizes politics over responsible archaeology. Elad has a long history of working to transform Silwan from a Palestinian neighborhood into a Jewish one. The idea is to make “facts on the ground,” in the parlance of the conflict, that will obstruct the possibility of any two-state solution that includes a Palestinian capital in East Jerusalem. Elad evicts Palestinians from their homes by exploiting legal loopholes or incomplete property records, it builds entirely new settler compounds, it uses archaeological sites to establish Jewish claims to certain strategic parcels of land, and it even erected a new visitors’ center on a contested piece of real estate. Some, like Israeli Prime Minister Benjamin Netanyahu, wonder why Israeli Jews and Palestinians can’t live side by side in Silwan. But anyone who has visited the neighborhood recently knows that what is happening there is not about, say, diversifying the neighborhood. It’s a hostile takeover. 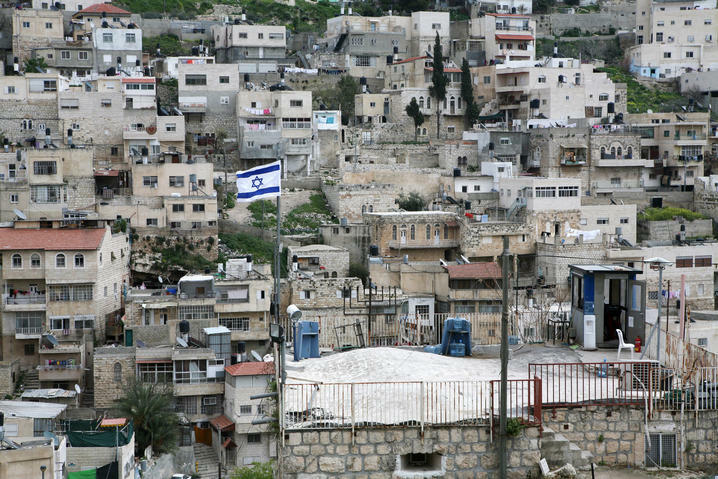 New fortified buildings topped by Israeli flags tower over the homes of longtime residents. Settlers walk through the neighborhood carrying guns, accompanied by armed guards. Meanwhile, the municipality virtually always denies Palestinians permits to build new homes or to renovate their old ones. Those Palestinians who dare to build anyway have their homes demolished, and—to add insult to injury—receive bills for the demolition and the cleanup of rubble. In this case, Elad claims to have purchased the apartments legally, via a U.S.-based shadow company. The Palestinians dispute these claims. While it will take some time to sort out the legal issues, we can say this: A person who has legally purchased a new home does not generally move in under cover of night, flanked by riot police. There is a special category in Jewish law for this kind of action. In the Talmud, the students of Rabbi Yochanan ben Zakkai ask why the Torah deals more severely with a burglar than with a mugger. Their teacher’s response: A mugger, who robs face-to-face, fears neither human beings nor God. But a burglar, who sneaks in when no one is looking, is afraid of human beings but shows no fear of God. In its use of subterfuge, shadow companies, and dead-of-night incursions, Elad represents the worst kind of thief. And Americans, Elad donors and pilgrims to Israel, are, in some indirect but important way, complicit. Jewish law strongly forbids aiding or abetting a thief. In one of the most important guides to Jewish law, Moses Maimonides rules that “It is forbidden to purchase stolen goods from the thief. . . for anyone who does such things or similar ones strengthens the hands of sinners. . . it is [also] forbidden to derive any benefit from a stolen object.” Those of us who donate to Elad, or pay admission to the Ir David archaeological site, aid and abet those who steal homes and land in order to prevent peace. As we ooh and aah over the excavations, we derive pleasure from these thefts. The good news is that we have the power to prevent these settlers from blocking a lasting peace agreement. This past spring, an Israeli court granted Elad control of Robinson’s Arch—the section of the Western Wall where men and women may pray together—as well as adjoining archaeological sites. T’ruah, the organization I direct, mobilized more than 1,000 rabbis and American Jews to oppose this transfer. The Reform and Conservative Movements of Judaism lodged their own complaints. The Prime Minister’s office responded with a promise to prevent the site from falling into the hands of Elad, and just last month, a judge overturned the earlier decision. Our voices matter. With its insistence on shoehorning Jewish settlements into longstanding Palestinian neighborhoods, Elad prioritizes its short-sighted political agenda over the long-term security of the State of Israel, alongside a viable State of Palestine. Imagine if instead, U.S. donors invested money in a lasting peace solution that grants both Jews and Palestinians a safe place in Jerusalem; allows Jews, Christians and Muslims to access their holy sites; and ends the decades-old conflict that has already claimed too many lives. *CLARIFICATION: This sentence, about visitors to Ir David, has been rewritten to reflect the lack of data about the number of American pilgrims. if we do not count the unknown number of refugees who were murdered at the sea trying to escape the despair of living in gaza with the constant fear of another massacre, ayman ziad abu jibba, 23, and abdullah jibril abu aser, 23 more people were killed in sheja’iya today and three reportedly injured. i’ll post more on the current situation in gaza these days. the boming has stopped, but the dying and the despair has not. and it is intentional and funded by us. GAZA CITY (Ma’an) — Two Palestinians were killed and three were injured on Friday when an unexploded Israeli bomb blew up in the al-Shujaiyya neighborhood of eastern Gaza City. A Ma’an reporter in Gaza said that a huge explosion was heard in the al-Shujaiyya area and ambulances rushed to the area immediately. Spokesperson for the Palestinian Ministry of Health in Gaza Ashraf al-Qidra said that two Palestinians were killed in the explosion. Al-Qidra identified the two as Ayman Ziad Abu Jibba, 23, and Abdullah Jibril Abu Aser, 23, and said that their bodies were taken to al-Shifa hospital in Gaza City. In mid-August, six people were killed in a similar explosion, and watch groups have warned that the ordnance is a particular threat to children, who often think the bombs are toys. The Gaza Strip is currently littered with a large number of unexploded Israeli ordnance, a constant reminder of the more than 50-day Israeli offensive that left more than 2,150 dead, 11,200 injured, and more than 110,000 homeless. Although Gaza police explosives teams have been working across the territory to destroy unexploded ordnance and prevent safety threats to locals, lack of proper equipment due to the seven-year Israeli siege as well as lack of resources more generally have hindered efforts. Even before the most frequent Israeli assault, unexploded ordnance from the 2008-9 and 2012 offensives was a major threat to Gazans.